"Glenn: Masterful how you shut [me] off . . . about standards of appellate review and let client tell her story about her baby! Prob. very important in getting them to accept a number. Thx,"
"Thank you, Glenn, for a job very well done." - Peter J. Lesser, Esq. "Glenn, I thought you did a good job and will recommend you to others if I have the chance." "You were fabulous. Immediately down to business – not like the mediators who tell you how fabulous they are for an hour before work commences." "Glenn Gottlieb was a focused and motivated mediator. He was able to help the parties reach a settlement of an emotional case with a disputed fact pattern in half a day." "I was pleasantly surprised we got a deal done. Testament to your skill!" "I just want to know that I really enjoyed working with you last week. You were the perfect mediator for our case. You were a quick study as to the substantive issues, but that is to be expected of a Boalt Hall graduate, with Law Review distinction. More importantly, you adeptly sized up the attorney and client dynamics and patiently worked with the parties to resolve a very challenging emotional case. I have been a trial lawyer and litigator for 32 years and have no difficulty saying that you are among the better mediators I have had (and I have had many). I will certainly keep you in mind for future assignments." "Glenn is an expert mediator. He has solid experience as a transactional lawyer as well, and this complements his abilities in functioning as a facilitator to settlements. He has a friendly demeanor and approach to mediation that helps the parties communicate and see through to the end of the conflict. I have used him in partnership cases with success. He is dogged and determined to get the matter settled for the long term interest of the parties." On behalf of my client and myself, I wish to thank you for your extraordinary efforts in resolving this most difficult case. Neither side was optimistic going into mediation, and even less so at the end of the first two sessions. Your persistent determination resulted in an eventual settlement though the parties were diametrically opposite on liability and damages. Again, thank you for a job well done." "Mr. Gottlieb was the reason – the only reason – my client entered into this partial settlement." "[T]he undersigned was extremely pleased with your efforts and abilities. I have passed [your] card and CV to all our [firm] lawyers advising them that you would be at the top of my list for any proposed mediators." "I came in highly skeptical about the value of mediation. I thought we would come and talk for a couple of hours and then be out of here without much being accomplished. I was surprised and pleased at the progress we made today. You did a great job, and I am now a believer in the mediation process!" "Thank you for your time and effort yesterday. We were happy with your approach to the mediation and I will indeed consider using you again and will refer other lawyers to you." "Thanks very much Glenn. I know the case would not have settled but for your superhuman efforts." 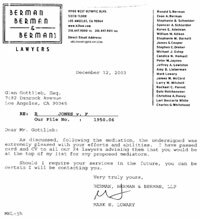 "When we came into this mediation, I did not give you a 2% chance; I did not give you a 1% chance – I gave you a 0% chance of achieving a settlement. You did an amazing job bringing these two hostile parties together and resolving the case." "You must be an incredible mediator. I did not think it was possible to resolve this case, and you did."